Vizio hasn't been successful in bringing a smartphone to the American market, but it has some devices available in Asia, and it has just announced some more HD smartphones for China. These are pretty nice looking handsets, and if they work as well as the spec sheets would suggest, we'd like to see Vizio take another shot at the American carrier system. Vizio is showing off two new smartphones that will be released in China, but could also run on AT&T's 3G network in the US. No LTE though, sorry to say. Maybe the best part about these devices is that both run stock Android Jelly Bean, no customization at all. The high-end model is a 5-inch 1080p device with a dual-core 1.5GHz Qualcomm processor and 2GB of RAM. 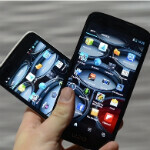 The lower-end device is a 4.7-inch 720p device with a 1.2GHz dual-core MediaTek chip and 1GB of RAM. Both devices have dual SIM slots. Both are nice looking handsets, but Vizio CTO Matt McRae admits that it is easier for the company to sell directly to customers in China, and it doesn't seem like the company has plans to try again in the US. Once again, our carrier system in the US is preventing devices like these from hitting our markets. I just wish Vizio would do the same as Google and offer them through their website unlocked. I would imagine they would cost around $300, or even less, which is appealing to many consumers. Lmao, Dr. Philly eh? Anyways, I agree for a 1080p jellybean clean android experience even without LTE would sell(look at the nexus 4) although it may have the HSPA compatible radio. It they sold this device unlocked I believe it could do quite well. As long as it has WiFi then it wouldn't be an issue you have multiple choices then, Wifi networks obviously. Cell hotspot devices that run on LTE networks. Whether it's your smartphone or a hotspot device. Or even rooting your phone to have it run off your signal. Same above reasons is what I'll be doing with the Nexus 10. The fact that it doesn't have a cell radio built in doesn't persuade me away from it at all.